This website https://www.robincollection.com/es/es is the property of ROBIN COLLECTION SL with Tax Code B66428970 and fiscal address in GRAN VIA CARLOS III Nº 51 3º 5ª 08028, BARCELONA, acting commercially under the trademark ROBIN COLLECTION SL. The General Terms and Conditions regulate the distance selling relationship between ROBIN COLLECTION SL and the user or client, in accordance with the legal stipulations, in particular Law 7/1998, of 13 April, on General Terms and Conditions, Law 3/2014, of 27 March amending the revised text of the General Law for the Defence of Consumers and Users, the regulations in force and applicable to Personal Data Protection, Law 7/1996 of 15 January on the Regulation of Retail Trade, and Law 34/2002 of 11 July on Information Society Services and Electronic Commerce. ROBIN COLLECTION SL reserves the right to make the modifications it deems appropriate, without prior notice, in the General Conditions. Such modifications may be made, through their websites, by any legally admissible means and shall be binding for as long as they are published on the website and until they are validly modified by subsequent ones. However, ROBIN COLLECTION SL reserves the right to apply, in certain cases, Particular Terms of Contract in preference to these General Terms when it deems it appropriate, announcing them in due time and form. The purpose of the website is the sale of swimwear, lingerie and accessories. The duration of the contract will be linked to the delivery of the product without prejudice to the right to cancel. You can also subscribe to the newsletter to receive product offers or general information that may be of interest to you. As a user or client, you expressly declare that you know, understand and accept the conditions of use and these general terms and conditions. In the same way, you declare to be of legal age and to have the legal and acting capacity necessary to access the websites of ROBIN COLLECTION SL and to enter into contracts by means of the same. To purchase our products, you can go to the corresponding section of our online store. It is a prerequisite that you register as a user of the website to make the purchase online. You can access the corresponding section for registration on the website itself. In accordance with what is established in current and applicable legislation on the Protection of Personal Data, ROBIN COLLECTION SL informs users that personal data collected during the registration process and subsequent purchase, will be entered into a file under their responsibility, in order to process such actions by the user and manage subsequent actions derived from them. Likewise, ROBIN COLLECTION SL informs of the possibility of exercising the rights of access, amendment, limitation of treatment, suppression, portability and opposition to the treatment of your personal data by means of a letter to the following address GRAN VIA CARLOS III Nº 51 3º 5ª 08028, BARCELONA or through the mail address info@robincollection.com. We inform you that we will process your data as long as your consent exists. During the purchase process you must identify yourself with the username and password provided. These data will not be made public. You are responsible for handling the identity and password obtained in the registration as a client confidentially and responsibly, and you cannot transfer them to another. You can modify the recorded information at any time in your customer area. In this same section you will have access to a history of your orders, this is only a consultation section, but you can manage it, being able to delete those records that you do not consider necessary to display. At the end of the purchase process, the customer will receive a confirmation by email. It is imperative that during the purchase process you provide a valid email address. If within 24 hours from the completion of the order you do not receive confirmation, please contact ROBIN COLLECTION SL on the customer service telephone +34 394996785 or via email address info@robincollection.com. All the contents of the website are in Spanish. The customer, upon receipt of the product at the delivery address provided, will receive an invoice or a copy of the order. If a product is on offer, the offer price and the validity of the offer will always be shown, along with its key characteristics. In compliance with current regulations, ROBIN COLLECTION SL offers information on all items on sale, their characteristics and prices. However, ROBIN COLLECTION SL reserves the right to cancel, replace or change the products offered through its website by simply changing its content. Thus, the products offered at all times by the website will be governed by the General Conditions of Contract in force in each case. Likewise, the company will have the right to stop offering, without prior notice and at any time, access to the mentioned products. The products offered in our online store are accompanied by a photograph and their essential characteristics, which is the information obtained from the manufacturer. The colour of the product that can be seen in the photograph is not binding. The characteristics will define it. to info@robincollection.com or to the points of contact established by the supplier himself. In case of doubt you can contact the customer service telephone +34 394996785 or via email at info@robincollection.com. All products show the selling price in Euros and include Value Added Tax (VAT). If any other tax is applicable, this would be indicated (IGIC or IPSI). ROBIN COLLECTION SL makes national and international shipments. 24/48H Shipping: From Monday to Thursday, place your order before 4pm and it will arrive the next working day. Orders placed on Fridays before 14h arrive on Monday, from 14h, Saturdays and Sundays will arrive on Tuesday. Valid only for the mainland. 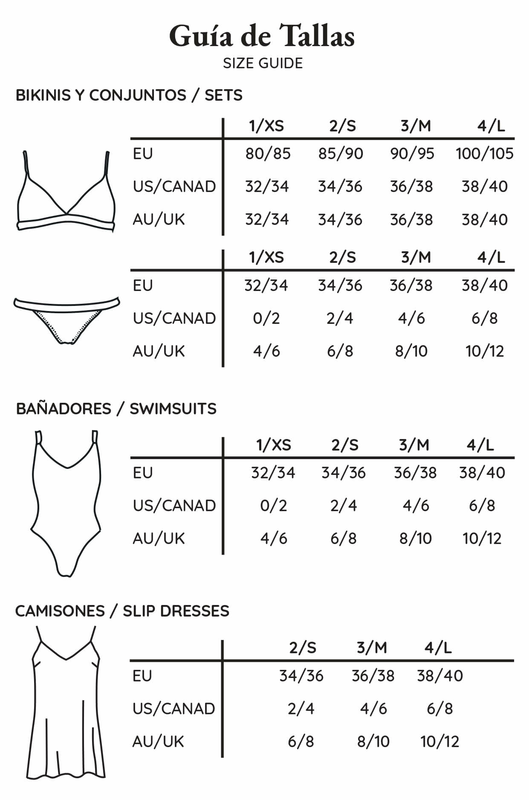 The distribution of swimwear, lingerie and accessories is done through CORREOS EXPRESS, UPS, MRW and MAIL BOXES. Once you have placed your order you will receive an e-mail with the tracking number, so that you can locate your package at any time. • The shipping costs for the Mainland will be 2.60€. • The transport costs are free of charge for the customer and will be borne directly by us if the amount of the order is greater than or equal to 60 euros. If the amount of the order is less than 60 euros, then the transport costs will be charged to the customer. • INTERNATIONAL shipping charges will be applied depending on the shipping area, size, weight, measures of the product as well as the amount of the order. The customer will be able to see the costs before making the purchase. • For shipments to the Balearic Islands, Andorra, Ceuta, Melilla and the Canary Islands, the mode of shipment is carriage due, establishing a procedure for the recovery of the corresponding Export Document (SAD) in the case of an export (Andorra, Ceuta, Melilla and the Canary Islands). All customs charges shall be borne by the consignee. All operations involving the transmission of personal or bank data are carried out using a secure environment, a server based on standard security technology SSL (Secure Sockets Layer). All the information you provide travels encrypted through the network. Likewise, your credit card details are entered directly on the bank's website, in the TPV (Bank's Point of Sale Terminal) and are not entered or registered on any server of ROBIN COLLECTION SL. When paying with a VISA or MASTERCARD you will always be asked for the following details: the card number, the expiry date, and a Validation Code that coincides with the last three digits of the number printed in italics on the back of your VISA or MASTERCARD, thus offering more guarantees about the security of the transaction. When the amount of a purchase has been fraudulently or improperly charged using a payment card number, the cardholder may demand the immediate cancellation of the charge. In such a case, the corresponding debit and re-credit entries in the accounts of the supplier and of the holder shall be made as soon as possible. However, if the purchase had actually been made by the cardholder and the demand for return was not a consequence of having exercised the right to cancel or resolve and, therefore, had unduly demanded the cancellation of the corresponding charge, the customer will be liable to ROBIN COLLECTION SL for compensation for damages caused as a result of such cancellation. When you select the bank transfer you will receive, together with the confirmation of your order, an e-mail with the bank details of ROBIN COLLECTION SL. It is very important that when making the transfer you specify in the object the order number, as well as your name and surname, and make the transfer within 3 days after the date of confirmation of the order to validate it. If you wish, you can send us the transfer receipt by email at info@robincollection.com. In any case, the order will not be considered effective until our administration department has bank confirmation of the transfer. We remind you that the payment must be made in EUROS and that all possible exchange rate fees and bank commissions must be paid by you. In the case of bank transfers made from outside Spain, it is very important that when ordering the transfer you always inform your bank to pay the commissions at origin, those bank commissions and expenses pertaining to your institution. If this is not the case, ROBIN COLLECTION SL could freeze the shipment of your order as it does not receive the full amount of it. Possible exchange rate fees and bank commissions are the responsibility of the customer. Allows you to send payments over the Internet safely and conveniently. PayPal's network builds on the existing financial infrastructure of bank accounts and credit cards to create a global real-time payment solution. PayPal offers a service specially designed for those who are not satisfied with traditional payment methods. More information at PayPal: http://www.paypal.com. The availability of products offered by ROBIN COLLECTION SL may vary depending on customer demand. Although ROBIN COLLECTION SL periodically updates the stock, the product requested by the customer may be out of stock at that time. In the event of non-fulfilment due to unavailability, ROBIN COLLECTION SL will notify the client by e-mail at the time it becomes aware of this situation. In no case shall the period of this communication exceed the maximum period of 30 days. ROBIN COLLECTION SL will be able to give the dual option of: providing the customer, without any increase in price, with a product of similar characteristics or of superior quality, or unless there are justified and demonstrable reasons for ROBIN COLLECTION SL within this same period to pay the sums paid for the cancelled order. The buyer will have a period of fourteen calendar days to cancel, from the day that the customer receives the product, without penalty and without giving reasons. The exercise of the right to cancel must be done by notification via telephone to +34 394996785, writing to our postal address GRAN VIA CARLOS III Nº 51 3º 5ª 08028, BARCELONA, or through the cancellation form. According to the provisions of Article 103 of Law 3/2014 of 27 March, which modifies the revised text of the General Law for the Defence of Consumers and Users, supplies of services or goods made according to consumer specifications or clearly personalised, or which, by their nature, cannot be returned or can deteriorate or expire quickly, are exempt from cancellation. WHAT SHOULD I DO TO RETURN OR EXCHANGE MY ROBIN? Next, send us your Robin to our atelier, please introduce in the bag a piece of paper with the same information that you have sent us by e-mail (order number, name, email...), you must send everything to us at calle Marià Cubí 195, local 08021 Barcelona. You can do it by mail or by any courier company. Remember that Robin does not bear the cost of this shipment. If you are from Barcelona or the surrounding area, or simply pass by here, you can personally come to our Atelier to make the exchange or receive your refund. Before you do this in person, please call +34 934996785 to make sure we can assist you. If you want to make an EXCHANGE of size, colour or model, you must follow the steps described above. Once we receive your Robin and we verify that it is in perfect condition, we will refund you the amount of your Robin by means of reimbursement in the credit or debit card with which you made your purchase and you will have to make a new purchase of the item that you want. The customer will bear the costs of returning the product. In any case, the products to be returned must be in perfect condition, unused and in their original packaging. To avoid transport issues, please ensure that the package is properly protected and sealed. Once received, we will check your status. As soon as we check that the item(s), possible components, accessories, promotional gifts and documentation are complete and in perfect condition, we will proceed to refund the money paid. The refund of amounts received by the customer will be made using the same means of payment used by the customer, unless otherwise stipulated. ROBIN COLLECTION SL may retain the refund until it has received the product, reason for cancellation, or until the customer provides proof of return of the same, depending on which condition is met first. In case of unjustified delay on the part of ROBIN COLLECTION SL, with regard to the return of the sums paid, the customer may claim double the sums paid, without prejudice to the right to be compensated for damages suffered that exceed that amount. Return of the defective product. In the event that the product is not in good condition and the causes are not attributable to the customer, the customer shall have the right to return the product, informing ROBIN COLLECTION SL of the reason for return through any of the means provided in these conditions of contract, and at no cost to the customer. This return due to defect or poor condition of the product will not be considered a right to cancel. ROBIN COLLECTION SL undertakes to bear the cost of return and to return the product for a new one in accordance with conditions accepted at the time of sale. If the client wishes to present a claim, the premises of ROBIN COLLECTION SL are in GRAN VIA CARLOS III Nº 51 3º 5ª 08028, BARCELONA or by e-mail info@robincollection.com. Also, ROBIN COLLECTION SL reserves the right to file civil or criminal actions it deems appropriate for improper use of its website and content or for failure to comply with these conditions. The relationship between the user and the provider will be governed by the regulations in force and applicable in the Spanish territory. Should any controversy arise, the parties may submit their conflicts to arbitration or resort to ordinary jurisdiction in compliance with the rules on jurisdiction and competence in this respect. ROBIN COLLECTION SL is based in BARCELONA, Spain.